The recorded modern history of competitive rowing precedes that of most other Olympic sports. The first Oxford-Cambridge race took place in 1828 and in 1852 Yale and Harvard rowed against each other for the first time on Lake Winnipesaukee, New Hampshire. The first modern Olympiad in 1896 was the only one not to feature rowing. The sport was on the programme that year, but rough seas forced its cancellation. Women's rowing was added at Montreal in 1976 and women now contest six of the 14 events. Both men and women compete in single, double and quadruple sculls, lightweight double scull, the eight and coxless pair. Men also race in coxless four and lightweight coxless four. For lightweight events, women must not weigh more than 59 kilograms with the average crew weight no more than 57kg, while men must not weigh more than 72.5kg with the average crew weight no more than 70kg. Rowers have an oar in each hand in sculling, but only one oar in sweep rowing. Boats have one, two, four or eight rowers, and the eights have a cox to steer the boat and direct the crew. In all the other boats, one rower steers using a foot pedal to control a small rudder. Boats race in heats and advance to either semi-finals or directly to a six-boat final depending on the number of contestants in each event. Losing boats get a second chance, with the top boats again qualifying. Although rowing is an endurance sport, boats can be travelling at up to 10 metres per second at the end of the 2,000m race. Crews sprint the first 500m at as many as 47 strokes per minute, drop to around 40 strokes per minute for the middle 1000m and shift back up a gear for the last 500m. Canoe and kayak racing was a demonstration sport at the 1924 Games and a full medal sport in 1936. Women's kayak events were added in 1948, but until 1972 only flatwater racing was on the Olympic programme. These are pure tests of speed held on calm water with competitors assigned to lanes. The more spectacular slalom racing was first held at the Munich Games, but then disappeared from the Olympics until 1992. The paddler's position, the one or two-blade paddle and the covered parts of the boat are all key in differentiating between canoes and kayaks. The original kayak, developed by Inuits in the northern Arctic regions, was made by stretching sea-lion skins over a frame of whalebone and driftwood. It was then waterproofed with whale fat. Kayakers sit in the cockpit of the boat and use a paddle with a blade on each end. North American Indians developed the original canoe - a dug-out, open-topped bark canoe. Canoeists paddle either kneeling on one knee or seated and use a single-bladed paddle. 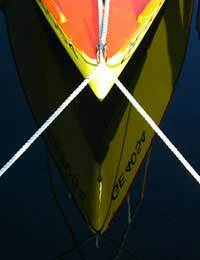 Canoes (often called Canadian canoes) are more open, but deck covers a proportion of the boat bow and stern. There are 12 flatwater events at the Olympic, nine for men and three for women. Men compete over both 500m and 1000m with one or two paddlers in canoe and kayak, and also over 1000m with four paddlers in Kayak. Women compete only in kayak over 500m, with one, two or four paddlers. In slalom racing, whitewater paddlers must cope with waves, holes, eddies and currents to negotiate between 20 and 25 gates in turbulent rapids. The quickest over a 300m course wins, although there are penalties for missing or touching gates. There are four events, three for men and one for women. Men compete in single and double canoe and single kayak, while women compete only in kayak singles.